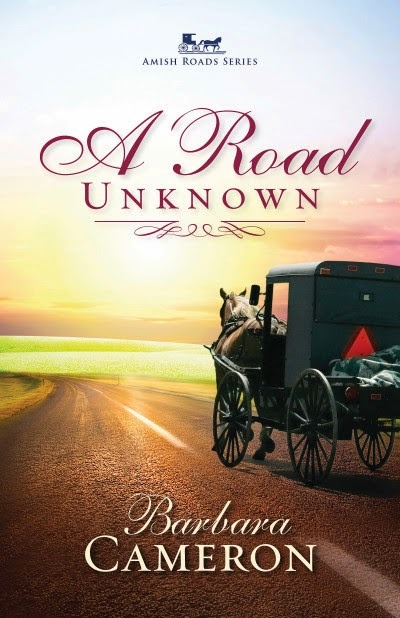 A Road Unknown by Barbara Cameron is the first book of a new series, Amish Roads. The series explores how contemporary society has changed Amish young people. In this book, Cameron looked at Elizabeth, a young woman who was the oldest of nine children. She had the heavy responsibility of helping her mother and caring for younger siblings with no time for her own interests. The author examined the issues faced by Elizabeth in a culture where young women stay in their parent’s home until marriage. The story was about Elizabeth’s struggle to identify who she was and who she hoped to become. There are many books written about Amish life and culture today. This one is somewhat different in that the protagonist leaves her home and moves into a condo with an Englisch roommate. Elizabeth learns to live with an electric coffee maker, a dishwasher and an electric sewing machine. She supports herself by working in a store that sells Amish handcrafts. Some readers may be disappointed because the setting is not typical. I thought that one of the best parts of the book was Cameron’s description of a real friendship. Paula, Elizabeth’s roommate was instrumental in helping Elizabeth figure out what she wanted and she was a wonderful friend. The stern Bishop and Elizabeth’s cold, uncaring grandmother were easy to dislike and fortunately were a contrast to the new Amish friends who accepted Elizabeth into the community. The book was easy to read and does offer a contrast to the usual Amish fiction. I do recommend it for the reader who enjoys this genre. I received a copy of this book from the publisher in exchange for a review. All opinions expressed are my own. When you come to a fork in the road, how do you decide where to go when your heart tells you to go left but your head says right? Barbara Cameron takes readers on a journey of new experiences, uncertainties, and faith in the first book, A Road Unknown, in the Amish Roads series. Although set in a quaint Amish backdrop, we've all faced the same dilemma as Cameron's lead character who feels as if she is being pulled in two different directions. Elizabeth is at a crossroad. She's been given the chance to experience life outside of her community, away from the responsibility to care for her eight younger siblings, but Elizabeth Bontrager can't decide which road to take. Goshen has its charms and pressures, but Paradise, Pennsylvania, sounds . . . well, like paradise. And it's also home to her Englisch friend, Paula. Decision made. Elizabeth is Paradise bound. But will the small town live up to its name? When Elizabeth meets Paula's friend, Bruce, she quickly learns he wants more than a friendship. And the same might be true of Saul Miller, her new boss at the country story that sells Amish products to the Englisch community. As the two compete for her attention, Elizabeth is surprised to realize she misses her family and becomes even more uncertain about where she belongs. She has a choice to make: return home or embrace this new life and possibly a new love? Barbara Cameron is a best-selling author who has a heart for writing about the spiritual values and simple joys of the Amish. She is the author of more than 38 fiction and nonfiction books, three nationally televised movies, and the winner of the first Romance Writers of America Golden Heart Award. Barbara is a former newspaper reporter. Some of her non-fiction titles include the Everything Weddings on a Budget Book and Her Restless Heart: A Woman's Longing for Love and Acceptance. Cameron currently resides in Edgewater, Florida.